This Native American-inspired costume is made of 100% polyester faux suede dress trimmed with plenty of fringe and geometric brocade ribbon. 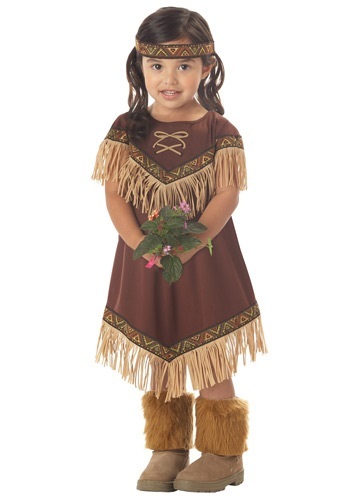 This costume even comes with a beautiful brocade headband and fur lined boot tops. As a sleeveless dress it fits with elastic in the back waist and also a Velcro fastener tab in the back. An elegant dark brown color, it features style details in that the hemline and triangular front yoke are edged with tan faux suede fringe and lovely geometric brocade ribbon. The headband continues the theme with geometric brocade ribbon that secures with a Velcro tab. Furry, golden faux fur boot tops fit over her own shoes to complete the theme.